we got the watchman to pluck out some kairis (raw mangoes) yesterday from our mango-tree. we had planted the tree over 13 years ago, and it just started bearing fruit last year. we can't wait for the mangoes to ripen on the tree, because somebody or the other from the street usually plucks them out out. the raw mangoes though, make for lip-smacking pickles. I suppose you could say the guy doesn't suffer from vertigo. I've had mango chutney but never pickled mangos. Yum! Come visit me when you have a moment. I've a new posting. 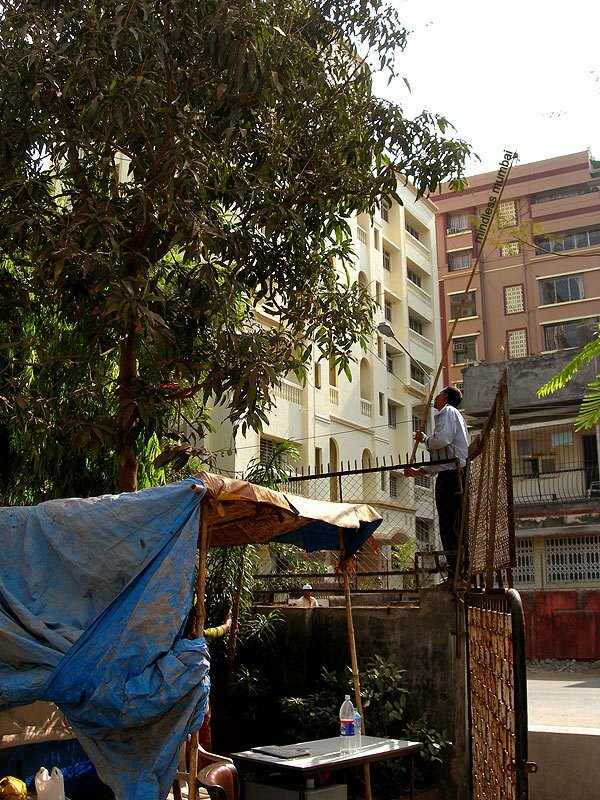 how can he pluck the mangoes with 'mindless mumbai' on the pole? I love pickled mangoes. My sister used to do them. We have a belief that once mangoes from a tree is pickled, the mangoes produced by that tree would no longer be sweet. Henceforth, the fruits would only be suitable to be used for pickle. finally, i saw this blog. i'm interested in the culture of hindu. recently i met with a priest from india and i shared to him my interest in visiting india. so i hope i get to see this place next year.